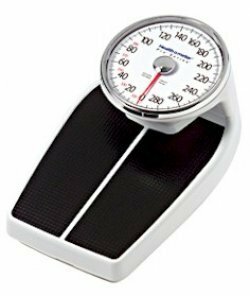 The HealthOMeter 160LB medical grade scale mechanism offers a professional level of accuracy at bathroom scale prices. Healthometer's patented Split Mat Design offers extra durability and optimal foot placement. This dial bathroom scale has a large platform and 8 inch raised dial allows for a larger foot placement area. This floor scale also features broadly spaced numbers for easy readability. With a heavy duty base and soft touch platform mat.